A "Hanok" is a type of traditional Korean house that embraces both nature and science. And these homes are gaining global recognition as being perfect acoustical settings to highlight the melody of classic Korean musical instruments that are similar to "zithers," which are essentially flat wooden soundboxes with several strings. Concerts held within Hanoks are popular tourist attractions in Korea, and when a team of researchers from Soongsil University in Seoul discovered this, they set out to explore whether the homes' excellent acoustics stem from their architectural structure as well as materials. During the Acoustical Society of America's Fall 2015 Meeting, being held Nov. 2-6, in Jacksonville, Fla., the team will describe their findings analyzing the harmony that results from playing traditional instruments within Hanoks. "Our study was inspired by the current situation within Seoul, the capital city of Korea, where you can find many modern high-tech concert halls best fit for playing Western-style musical instruments, but few for playing traditional Korean instruments," explained Myungsook Kim, associate professor of English and a senior researcher at The Sori Sound Engineering Lab at Soongsil University. Hanoks are crafted from natural materials such as clay, soil, rocks, stone, wood and paper. They also feature "Ondol" floor heating systems that tap thermal conduction and convection of heat from a fireplace that is located under the floor or outside of the house. These homes also tend to be strategically positioned so that the "doors and windows are located on south- and east-facing sides because cold wind comes from the northwest during winter, while a cool breeze blows from the southeast during summer," said Kim. In terms of architectural characteristics with respect to acoustics, Hanoks boast a "wooden floor usually built up high atop stone blocks on the ground level, so that it sounds like a resonance pipe," Kim pointed out. "The wooden floors work well for low-frequency sounds." 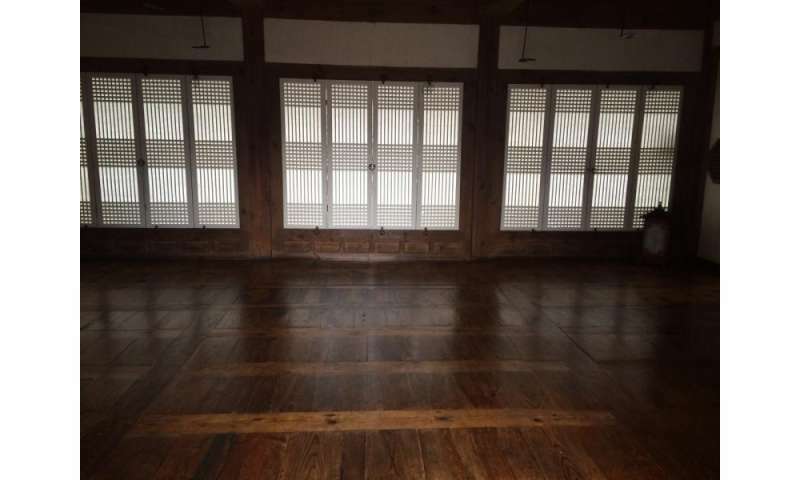 Hanoks also have plenty of windows for air circulation, which use "wooden frames and Korean paper called 'Hanji,' made from natural wood pulp," noted Kim. "Paper windows not only maintain the temperature balance but also absorb and reflect sound." Another key architectural characteristic for beautiful acoustics: the ceilings. "The arch-shaped ceiling and rafters work well for collecting sound and improving its amplitude and clearness," Kim said. Based on these combined architectural characteristics, when the team examined the acoustics of the instruments within the Hanok, they found that earthen walls and paper windows absorb and reflect sound, akin to "breathing in and out," while the ceiling rafters collect and magnify sound. "Wooden floors and the space between the floor and stone blocks work together to play like a resonance pipe or a 'soundbox'—spreading sound to every corner of the house," Kim added. "The floors work well for low-frequency sounds and arch-shaped ceilings with rafters are good for keeping the balance of sound within all frequency ranges. As a result, the reverberation time lasted for 1.2 to 1.3 seconds—excellent for enjoying music with improved amplitude and clearness." The team's acoustical analysis of Hanoks proves that they have special acoustical features similar to those of small music concert halls or opera houses. "In particular, traditional Korean musical instruments—including 'gayageum,' which is a Korean zither with twelve strings, or 'geomungo,' with six strings—fit suitably into Hanok because of their relatively small size," said Kim. "When visiting Hanoks, people can enjoy Korean music as well as architectural designs." Next, the team plans to continue their pursuit of perfect acoustical harmony by studying other traditional Korean musical instruments within Hanoks. "We'll also compare the acoustical characteristics found within other types of homes in Korea to try to enable creating optimal acoustical spaces in our daily lives," Kim said. Why's there chatter in my Himalayan singing bowl? More information: Presentation #4pAAb5, "A study on the analysis of hanok (the Korean traditional houses) acoustic characteristics" by Myungsook Kim, will be take place on Thursday, Nov. 5, 2015, at 4:20 PM in Grand Ballroom 3. The abstract can be found by searching for the presentation number here: https://asa2015fall.abstractcentral.com/planner.jsp. What is a 1-dimensional mirror?